Fort Myers Vacation Packages - Discover Our Florida Vacation Specials! Want to visit South Florida for your next vacation but are looking online for a better deal? Then take advantage of the great sales we periodically offer vacation travelers. These Florida vacation package deals are ones that you won't want to pass up. Check this page for new Sanibel Harbour & Fort Myers vacation packages and deals on our standard, deluxe, and luxury vacation rentals at Resort Harbour Properties. Book and Stay within the next 10 days and receive a WHOOPING 35% off the Rental Rate. 3 night minimum stay required. All other booking charges and fees apply, see below for terms. Save up to 30% OFF in April! Take advantage of limited time savings on reservations arriving now through April 30th in our 2 bedroom - 2 bathroom waterfront condos. Limited availability for some dates so don't delay! > 30% off: LUXURY Category Condos > 20% off: DELUXE Category Condos > 10% off: STANDARD Category Condos. Discount is automatically applied to eligible properties and dates when searching availability. Hit the beach this Mother's Day and take advantage of a FREE 3rd night when you book direct using promo code MOM2019 at checkout. Step into your waterfront condo and you will also be greeted with a complimentary bouquet of fresh flowers just for Mom! Enjoy 15% off this April in a 3 bedroom - 3 bathroom condo. 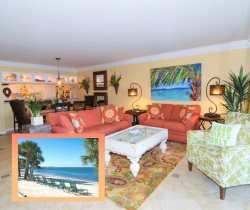 These waterfront condos accommodate up to 8 guests. Limited availability so do not delay! Select 3 BEDROOMS from the Search Rentals drop down option to preview condos. Discount is automatically applied to eligible properties and dates when searching availability. Book Direct with Resort Harbour Properties for the best rate guaranteed. Booking direct allows you to book your dates, in your preferred condo, at our best rate! If you require assistance or have questions, please feel free to contact our on site office at (239) 590-9127. Simply call us at 877 - 850 - 0414 to speak with our staff to obtain the best rate available. Monthly rental rates range from $2,373.00 to $5,097.00 in the off season and $4,998.00 to $12,066 in the high season months of Dec - April. OFFER TERMS: Discount is applied to the rental rate and offer is based on availability. Offer may not be available on all rental properties. All rates are subject to a departure cleaning charge, $35 processing fee and 11.5% tax. This offer cannot be combined with other discounts, packages, promotions, and cannot be applied to existing reservations. Promotions dates and discount subject to change without notice.